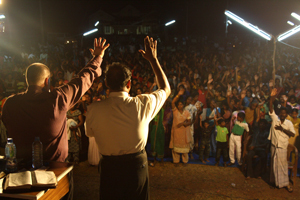 In March of 2011 David & David went to a country in South-Asia to minister. First to teach and then to conduct a festival. They were teaching in the two newly started bibleschools. one in the mountainareas which has 13 students and the other one in the lower regions which has 18 students. - We are believing for good results from this first group of bibleschool-students, David says. After the teaching they went to the northern part of the country to do a festival, which was the first one in this area for Pioneer Mission. have strict control, David says. Some areas have terrible marks from the war. We had some struggle to get permission to enter, but by Gods grace with a help of a keyperson, we came through. On the second day, the festival had to move to another field because of pressures from some fanatic hindus. But the new location was just on the other side of the road so it was easily arranged. - We were doing this festival together with two local churches. One pastor said that during his 25 years in the area, there had never been any festival. There was a great joy among the believers and among the people. The last night around one thousand people were gathered. Jesus did many wonderful things these four nights. - One man who was wounded during the war, still having metalsplinter in his body came all four nights, David tells. The first night he said that he had no feelings left because of all the traumatic things that had happened and he also said he had daily pain for several years because of the splinter. - But the last night at the campaign he said that now he had hope for the future. and his physical pain was also totally gone, David concludes.